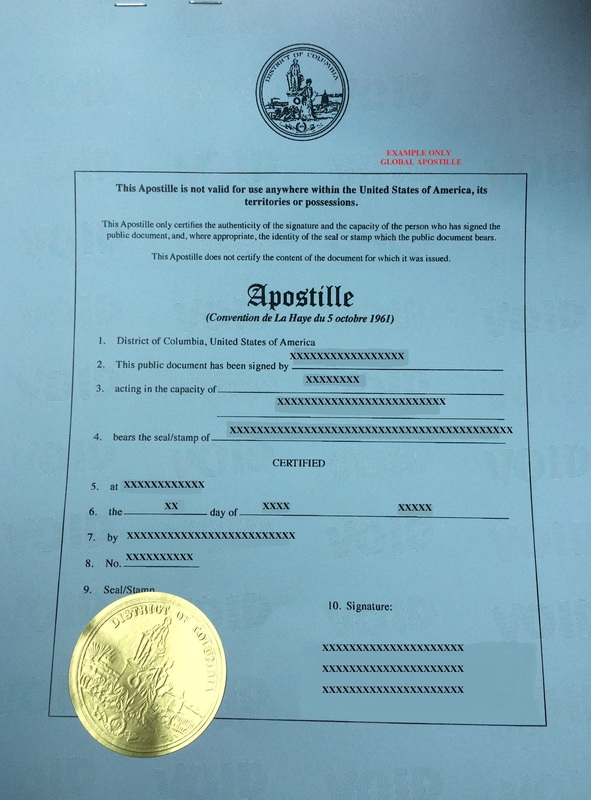 Washington, D.C. apostille, how to get apostille in Washington, D.C.
Do you have a document issued in Washington, D.C.? Do you have to present this document in a foreign country? We will be glad to assist you in apostilling or certifying your document. Please use the blue Contact form to email us your request and specify the country where the document is going to be used. You can also upload a scanned copy of your document so we can review it (free of charge) and let you know if the document is ready to be apostilled. "I have received the certificate with the apostille. You service was very good, efficient, good communication and faster than I expected." "Global Apostille are professionals when it comes to taking care of legalizing documents (in my case it was petition for name change for my child)." "Thank you so much for your help; your office has been very efficient. I hope I will use your services again soon."